In the first of a three part mini-series recorded in Westward Ho! 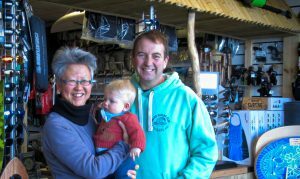 in North Devon, kitesurfer Pete Sawyer talks with Creative Conversations host Yang-May Ooi about how his passion for kitesurfing helped him create a new business and rebuild his life by the Atlantic Ocean after insolvency and divorce. My partner and I have been coming to Westward Ho! for the last few years. We love the vast sandy beach and the wild ruggedness of the crashing waves of the Atlantic Ocean – and also the laid back friendly vibe of this quirky seaside village named after a Victorian novel by Charles Kingsley. Being ever curious about people and places (or should I say, nosy? ), I wanted to find out more about the lucky and lovely people who call this place home. Pete Sawyer, owner of the Kitemare Kite and Surf Shop in the centre of Westward Ho! is the first of three creative locals who warmly and kindly agreed to share their stories on the Creative Conversations podcast. Day of the Dead, Seafield House, Westward Ho!